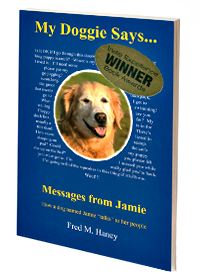 My Doggie Says... by Fred Haney E-book Here’s another way to learn “dog talk.” Download the E-Book version of “My Doggie Says... 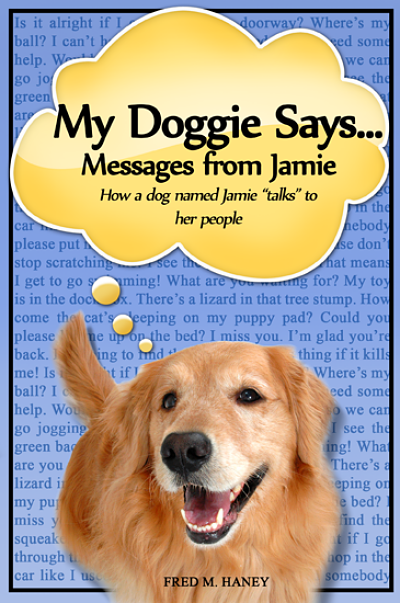 Messages from Jamie.” Use your computer or reader to see the same color photographs and stories that will help you interpret your dog’s messages. Why did my dog do that? What is my dog trying to tell me? How can I figure out the message? Read the fun examples in this E-Book, and you will be well on your way to understanding the important things your dog is trying to tell you -- and having a closer relationship with your pet. 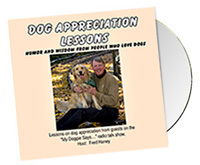 Dog Appreciation Lessons - Humor and Wisdom from People who Love Dogs. Ted Kerasote's dog, Merle, "reads the news"
These books will help you and your friends gain a deeper appreciation for "man's best friend." They all deal with the relationships between people and dogs in different ways. Many of them can help you improve your communication with your pet, in order to strengthen your bond and nurture your dog's personality. Whether you read "Merle's Door," a charming tale of an outdoorsman and his dog, or "How to Speak Dog," a more scientific treatise on how to communicate with your dog, all of these books address different aspects of the dog-human relationship. Each of these authors has been a guest on the "My Doggie Says..." radio show. You can stop and start the "carousels" by simply mousing over an image or by mousing over and clicking on the double "pause" bars.